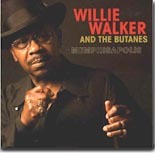 Minneapolis soul/blues ensemble Willie Walker and the Butanes checks in with what may be the best disc of the year, Memphisopolis. If you love classic Memphis-style soul, then don't miss this month's Pick Hit. Yes, it's really that good! What happens when a young woman from down under goes into a Texas studio with some of the best blues talent from the US? Find out by listening to Fiona Boyes' great new CD, Lucky 13, our Surprise hit. We take a look back at a 1970s era classic, Hard Again, from Muddy Waters, in our Flashback section. Bonus points if you know the origin of the album title. This month's What's New section features new releases from Jimmy "Duck" Holmes, Big George Brock, Mel Brown, Ike Turner, Alvin Jett & the Phat Noiz Blues Band, Albert Cummings, Joe Bonamassa, the eclectic Bobby Lounge, and Jeff Healey with guest Chris Barber, plus reissues of classic live recordings from Aretha Franklin and King Curtis.